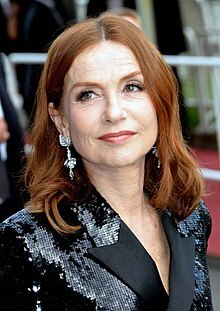 Isabelle Anne Madeleine Huppert (French pronunciation: ​[izabɛl yˈpɛʁ]; born 16 March 1953) is a French actress who has appeared in more than 120 films since her debut in 1971. She is the most nominated actress for the César Award, with 16 nominations. She twice won the César Award for Best Actress, for La Cérémonie (1995) and Elle (2016). Huppert was made Chevalier of the Ordre national du Mérite in 1994 and was promoted to Officier in 2005. She was made a Chevalier of the Legion of Honour in 1999 and was promoted to Officer in 2009. Huppert's first César nomination was for the 1975 film Aloïse. In 1978, she won the BAFTA Award for Most Promising Newcomer for The Lacemaker. She went on to win two Best Actress awards at the Cannes Film Festival, for Violette Nozière (1978) and The Piano Teacher (2001), as well as two Volpi Cups for Best Actress at the Venice Film Festival, for Story of Women (1988) and La Cérémonie. Her other films in France include Loulou (1980), La Séparation (1994), 8 Women (2002), Gabrielle (2005), Amour (2012), and Things to Come (2016). 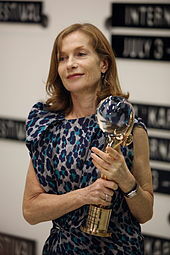 Among international film's most prolific actresses, Huppert has worked in Italy, Russia, Central Europe, and in Asia. Her English-language films include: Heaven's Gate (1980), I Heart Huckabees (2004), The Disappearance of Eleanor Rigby (2013), Louder Than Bombs (2015), and Greta (2018). Huppert is the most nominated actress for the Molière Award, with 7 nominations. 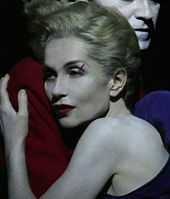 She made her London stage debut in the title role of the play Mary Stuart in 1996, and her New York stage debut in a 2005 production of 4.48 Psychosis. She returned to the New York stage in 2009 to perform in Heiner Müller's Quartett, and in 2014 to star in a Sydney Theatre Company production of The Maids. In 2019, Huppert starred in Florian Zeller's The Mother at the Atlantic Theater Company in New York. ^ Szwarc, Sandrine (11 May 2015). "Isabelle Huppert bientôt sur la scène de l'Espace Rachi" (in French). Actualité Juive. Retrieved 21 February 2017. ^ "Entretien avec Caroline Huppert" (PDF) (in French). groupe25images.fr. Retrieved 13 December 2016. ^ "Médée d'Euripide, mis en scène par Jacques Lassalle à Avignon" (in French). En Scènes. 10 July 2000. Retrieved 29 January 2017. ^ "Hedda Gabler" (in French). Les Archives du Spectacle. Retrieved 19 February 2017. ^ Rajchman, Olivier (26 February 2017). "Isabelle Huppert : découvrez son compagnon et ses enfants" (in French). Télé Star. Retrieved 22 March 2017.